The official report of Major J. 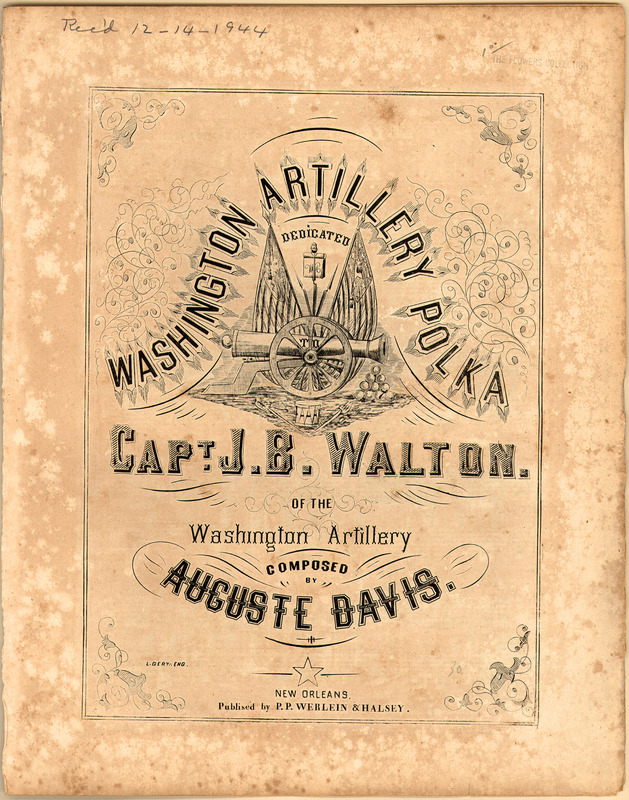 B. Walton of the Washington Artillery of New Orleans presents a slight problem. It seems Walton has no official status in the Confederate order of battle. As the four companies of the battalion were distributed throughout Beauregard’s army, I’m thinking of adding Walton under Bory’s artillery chief, Col. Jones. I have to think on that. Four 12-pounder howitzers, under command of Lieut. T. L. Rosser, commanding, Lieut. C. C. Lewis, Lieut. C. H. Slocomb, and Lieut. H. A. Battles, with General Ewell’s Second Brigade, at Union Mills Ford. Two 6-pounders, smooth bore, under command of Capt. M. B. Miller, Lieut. Joseph Norcom, with General Jones’ Third Brigade, at McLean’s Ford. One rifled 6-pounder and one smooth 6-pounder, under command of Lieut. J. J. Garnett, Lieut. L. A. Adam (reported sick after being engaged in the battle of the 18th instant, with General Longstreet’s Fourth Brigade, at Blackburn’s Ford. Five guns, three smooth 6-pounders, two rifled 6-pounders, under command of Lieut. C. W. Squires, Lieut. J. B. Richardson, and Lieut. J. B. Whittington, with Colonel Early’s Fifth Brigade, then bivouacked near McLean’s farm house. At about 7 o’clock on the morning of the 21st an order was communicated to me to follow with the battery under Lieutenant Squires the brigade of General Jackson, then on the march towards Stone Bridge. Every preparation having been previously made, the order to mount was immediately given and the battery moved forward, arriving at Lewis’ farm house just in time to receive the first fire from the enemy’s guns, then in position near stone bridge. Here I was ordered to halt and await orders from General Bee. Shortly after 8.30 o’clock a.m. I detached two rifled guns, under Lieutenant Richardson, and took position about one-half mile to the left of the Lewis farm house, where the enemy was found in large numbers. Fire was at once opened by the section under Lieutenant Richardson, and continued with good effect until his situation became so perilous that he was obliged to withdraw, firing retiring until his guns were out of range, when he limbered up and reported to me. In this engagement one of the enemy’s pieces was dismounted by a shot from the rifled gun directed by First Sergeant Edward Owen, First Company, and other serious work was accomplished. Now, under direction of General Cocke, I took position in battery on the hill in front of Lewis’ farm house, my guns directed toward stone bridge, where it was reported the enemy was about to attack. Shortly before 10 o’clock orders were communicated to me to advance with my battery to a point, which was indicated, near the position lately occupied by the section under Lieutenant Richardson. Here we at once opened fire, soon obtaining the range with the rifled guns against artillery and the 6-pounders, with round-shot, spherical case, and canister against infantry, scattering by our well-directed fire death, destruction, and confusion in the ranks of both. As the enemy’s artillery would frequently get our range, we advanced by hand to the front until finally the battery was upon the crown of the hill, entirely exposed to the view of their artillery and infantry. At this moment their fire fell like hail around us, the artillery in front of our position evidently suffering greatly from the concentration of fire from my guns and those of the battery on my right, and notwithstanding we were at this time also subjected to a terrific fire of infantry on our left, my guns were as rapidly and beautifully served by the cannoneers, with as much composure and silence as they are when upon the ordinary daily drill. The batteries of the enemy on our front having become silenced, and the fire of the infantry upon our left increasing, I considered it prudent to remove my battery from the then exposed position, being nearly out of ammunition (some of the guns having only a few rounds left in the boxes). The order to limber to the rear was consequently given, and my battery, followed by the battery on my right, was removed to its first position upon the elevated ground near Lewis’ farm house. At about 1 o’clock, as nearly as I can now calculate, Lieutenant Squires was detailed with three 6-pounders, and took position near the road leading to the stone bridge from Lewis’ farm house and directed against the enemy’s artillery, which had now opened fire upon our position from the vicinity of stone bridge. This fire having been silenced by some guns of Colonel Pendleton and the guns of my battery under Lieutenant Squires, we discovered from the position on the hill the enemy in full retreat across the fields in range of my rifled guns. I opened fire upon their retreating columns, which was continued with admirable effect, scattering and causing them to spread over the fields in the greatest confusion, until I was ordered to discontinue by General Jackson, and save my ammunition for whatever occasion might now arise. Subsequently I was permitted by General Johnston to open fire again, which was now, after having obtained the range, like target practice, so exactly did each shot do its work: the enemy, by thousands, in the greatest disorder, at a double-quick, received our fire and the fire from the Parrott guns of the battery alongside, dealing terrible destruction at every discharge. This ended the battle of the 21st, the last gun having been fired from one of the rifles of my battery. The guns of this battery, under command of Captain Miller, with General Jones’ brigade, and Lieutenant Garnett, with General Longstreet’s brigade, were not engaged at their respective points, although under fire a portion of the day. The howitzer battery, under Lieutenant Commanding Rosser, with General Ewell’s brigade, was on the march from 2 o’clock p.m. in the direction of Fairfax Court. House, and, returning by way of Union Mills Ford, arrived with the reserve at my position unfortunately too late to take part in the engagement, notwithstanding the battery was moved at trot and the canonneers at a double-quick the entire distance from Union Mills Ford. In this battle my loss has been one killed, Sergeant J. D. Reynolds, Fourth Company ; two wounded slightly, Corporal E. C. Payne, First Company, and Private George L. Crutcher, Fourth Company. There were three horses wounded, two belonging to the battery and one officer’s horse. I cannot conclude this official report without the expression of my grateful thanks to the officers and men under my command for their gallant behavior during the entire day. They fought like veterans, and no man hesitated in the performance of any duty, or in taking any position to which it was indicated they were required. In a word, I desire to say these men are entirely worthy of the noble State that has sent them forth to battle for the independence of the Confederate States. To Lieutenant Squires, commanding, I desire especially to direct your attention. A young officer, the second time under fire (having been in the engagement of the 18th), he acted his part in a manner worthy of a true soldier and a brave man. He is an example rarely to be met. Lieutenants Richardson and Whittington, each with his battery in the engagement of the 18th, were in this battle, and bravely did their duty. Lieut. Will Owen, adjutant, and Lieut. James Dearing, Virginia forces, attached to this battalion, accompanied me. To them I am indebted for valuable services upon the field. Frequently were they ordered to positions of great danger, and promptly and bravely did they each acquit themselves of any duty they were called upon to perform. I could mention individual instances of bravery and daring on the part of non-commissioned officers and privates would not be invidious where all behaved so well. In conclusion, general, I can only say I am gratified to know we have done our duty as we were pledged to do.